These diamond shaped shakkarpara - Jaggery Biscuits for my family, who gives me their constant love, encouragement and all the support I need. 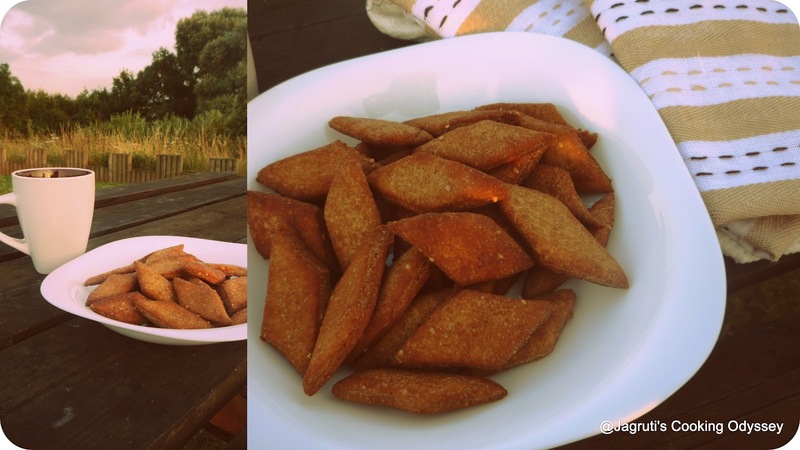 Shakkapara, a perfect tea time snack or when you are out and about just take out from your bag and start munching. Nowadays kids being at home I need to keep something to munch. Slightly healthier than shop bought cookies or biscuits as these para are made out of whole wheat flour and Jaggery. Place jaggery in one bowl and add 1/4 cup water. Mix well till jaggery dissolves completely. Sieve the jaggery water with fine sieve to remove any dirt from the jaggery. ( I used normal plastic tea strainer ). Now add flour, sesame seeds and ghee in to the jeggery water. Cut each of the rolled dough into square or diamond shape with pizza cutter or knife. Remove it from the hot oil. let it cool to room temperature they will go crispy. Serve with hot cup of masala tea. Linking it to Know Your Sweetness - Jaggery guest host by Archana event by ME. I love anything made with jaggery..
Yup.. I remember these.. they were a must on every summer vacation trips..